I find knitting with 4mm needles and aran weight yarn (Red Heart Super Saver Solids, aran colour) a lot easier than 2mm needles and size 10 thread (Aunt Lydia’s Bamboo Crochet Thread)! I decided to use the Fleurs de Lis for Parris KAL pattern to make a tote bag. Since I’ll need 2 of the squares, I am making them both now so I don’t get stuck in “second sock syndrome”–I don’t want to finish 1 square then move on to another project, and wait weeks for the inspiration to knit the 2nd! All I have to do is knit 1 square with the yarn end from the centre of the skein, and the second square with the yarn end from the outside of the skein. I knit today’s 10 rows in the thread first. I haven’t decided what to make with the square–but it is too hard on my old eyes to knit enough squares for a large project! I also find the thin needles aggravate the arthritis in my knuckles and finger joints. I have finished my three sets of pattern rows for Day 2, so now I am going to browse through a Victorian era magazine that is filled with amazing illustrations and patterns. The magazine is in French, but with the aid of online translation and knitting/crochet term charts I have made several La Mode designs. 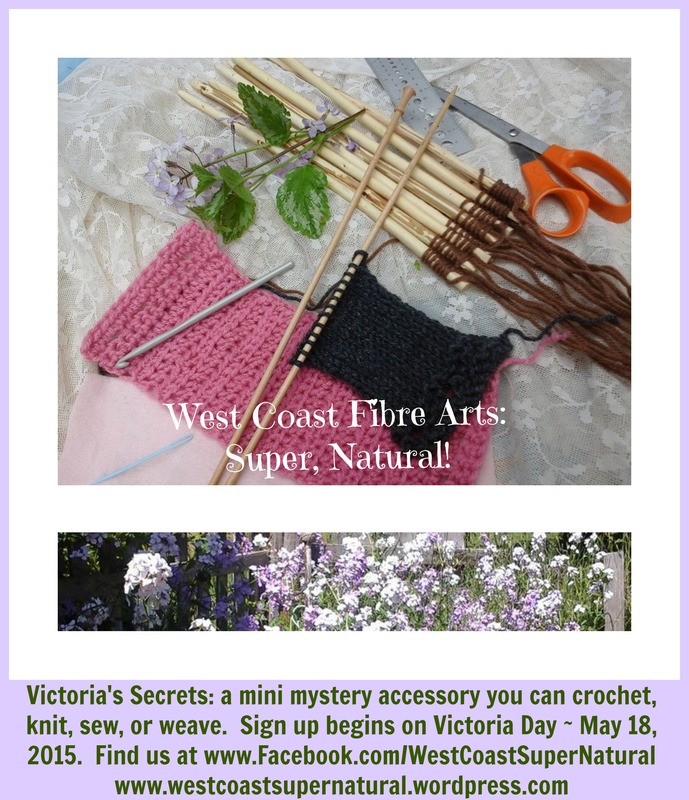 Sign up now for “Victoria’s Secrets” mini mystery: you can knit it, crochet it, weave it, or sew it! From now until the 31 May/2015 it is just $1.00, instead of the regular price of $2.95–use the coupon code found on the pattern page. 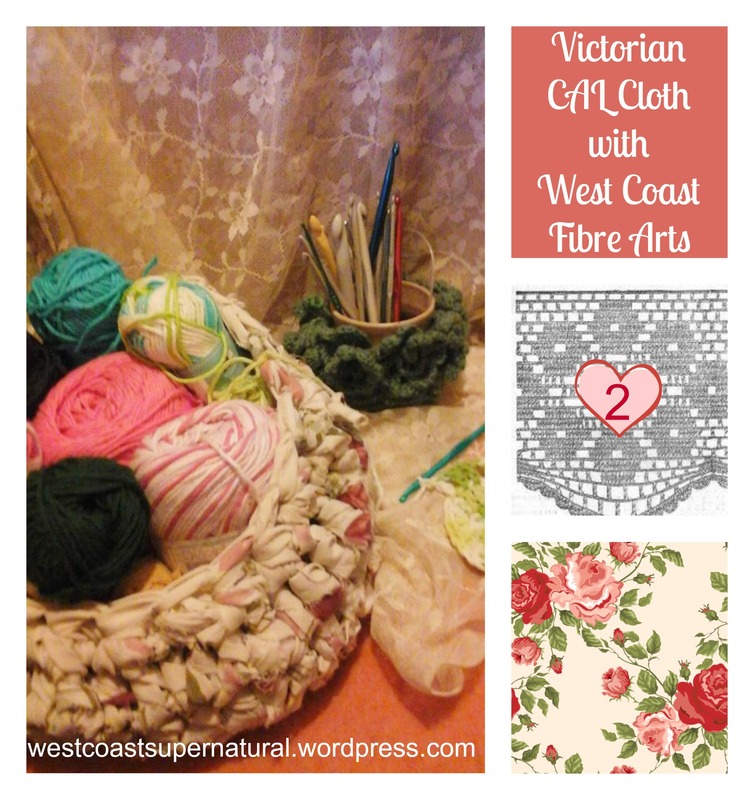 One pattern will show you all these options to make a quick little accessory based on a Victorian sewing pattern! 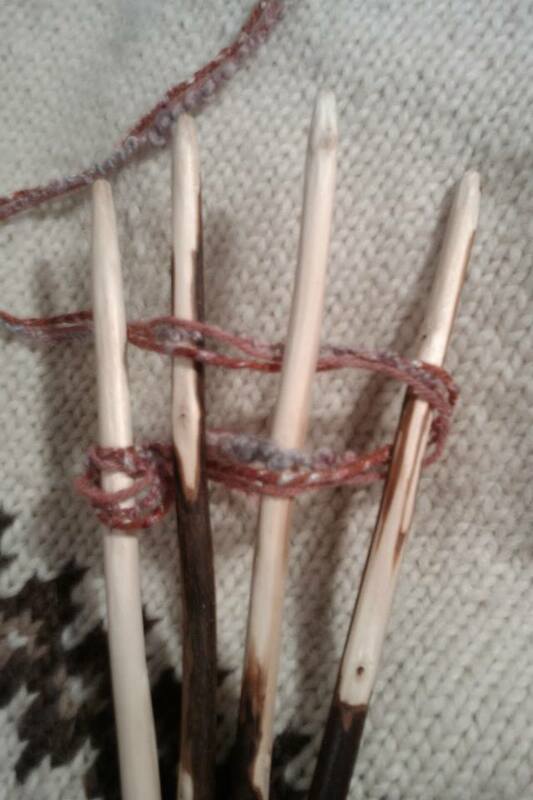 You can use any yarn, with the right sized needles or hook–because you will cast on or make the beginning chain a certain length, instead of a specified number of stitches 🙂 You can use weaving sticks to make them…or upcycle a felted wool sweater; try making a shabby chic/boho set, too! (4 for $16, or 6 for $24, 8 for $32): hand made from local Comox Valley wood. Ships within 7-10 days. For the Victoria’s Secret pattern I am using 8 weaving sticks. These are handcrafted from Vancouver Island reclaimed wood sticks, each one is unique and special! No two are identical, and will have slight bends and some will have some inner bark left on. Just send me a private message on Facebook and I’ll get back to you with a Paypal invoice that includes shipping to your postal code/zip code. 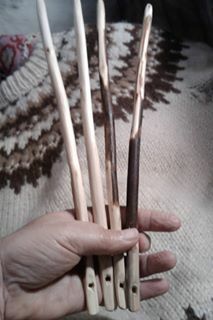 Weaving sticks are easy to use and a lot of fun for making scarves, too! Even young children can use them. 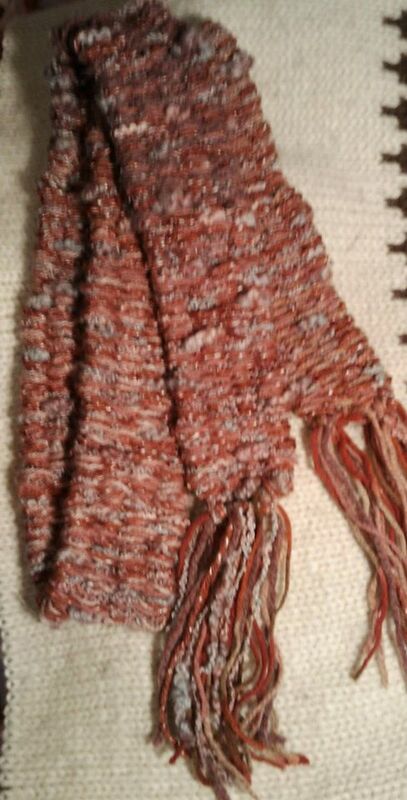 They are fun for making “skinny scarves” using as few as 4 sticks; you can use several strands of yarn at once to make weaving really fast! Great stashbusters! There are more photos here on my Facebook page. 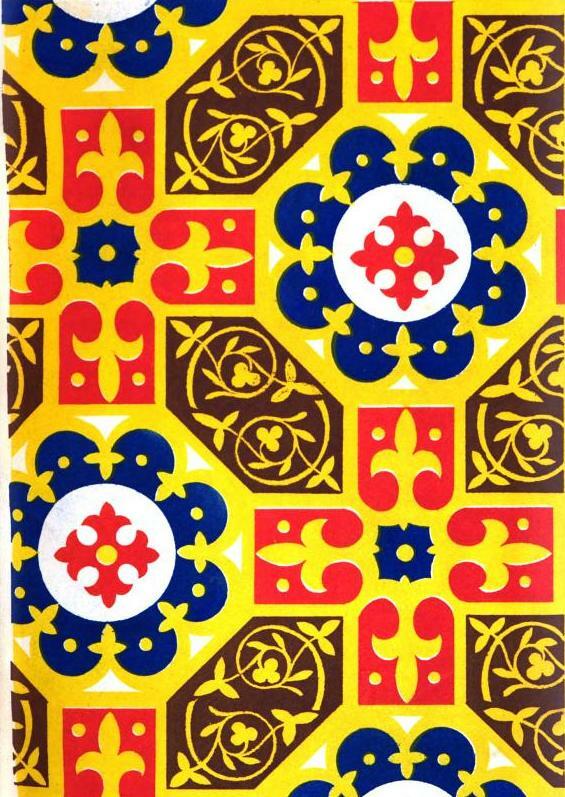 This week’s Victorian Flower pattern is a motif that forms part of an 1888 Victorian era “Mat” or d’oyley. I’ll rewrite the whole pattern, soon , and include it in a book of designs inspired by this Friday Flowers series. As a motif the flower can be used to adorn hats, headbands, or bags; you can add crochet chains from each side and use them as a gift tie, as I have done on this crocheted lace washcloth. They can be made with thread or with yarn–just use the hook that you’d normally use with the weight of yarn, remembering that you want the work to be quite tight so that the petals hold their shape. Be sure to come back next week to see what the new Friday’s Flower will be! Tomorrow, on February 1st, the 2nd Crochet Cloth of the Month will be released. It is a 1-Clue Mystery: the mystery is that you will not know what the cloth looks like until you make it! You can bring a little mystery and fun into your life, and look through a little window into the Victorian Era! 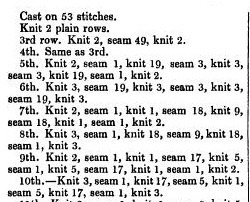 The cloths in the Victorian CAL Cloth are all inspired by stitch patterns, stories & poems I discover while reading Victorian books and magazines. There will be a little ‘bonus’ pattern in with the cloth, too–last month there was a pattern for coasters to match the cloth, so it could be used as a table mat & coaster set. What will the Bonus Pattern be for February? It’s a mystery! The February cloth is called Victorian CAL Cloth 2; you can pre-purchase now and receive an automatic update tomorrow with the full pattern. 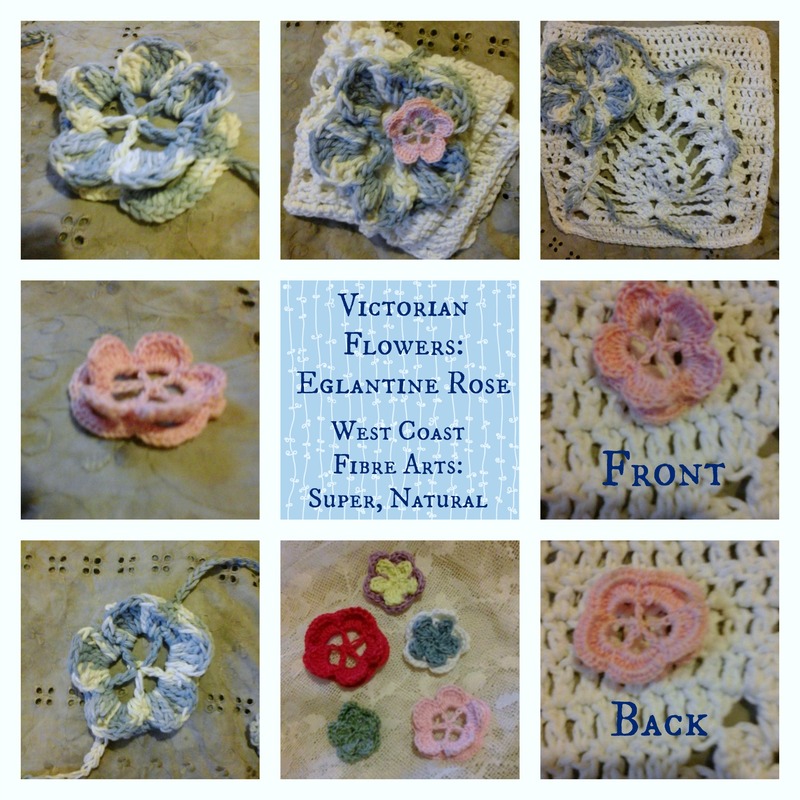 You are welcome to join the West Coast Fibre Arts Group on Ravelry, to share comments & photos or ask for help if you need it. For the first week, from now until 7th Feb. 2015 at midnight Pacific Time, the Victorian CAL Cloth 2 will be 50% off its regular low price of $1.95. 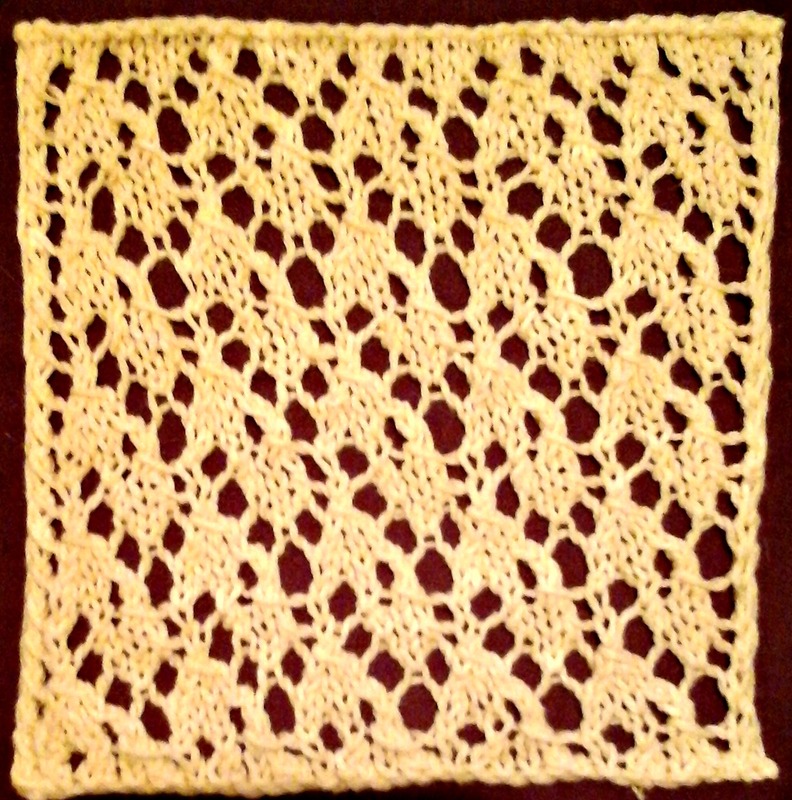 The cloth only uses chain stitch, double crochet (Canadian/US terms used), and slip stitch.